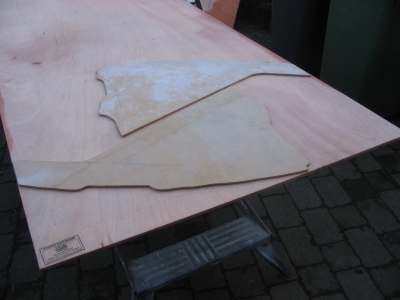 Patterns for the bulkheads were drawn with light cardboard and then transferred to fibreboard which was then checked on the boat for a good fit. Tracing the contours on the underside of the deck and the inside of the hull was not easy. 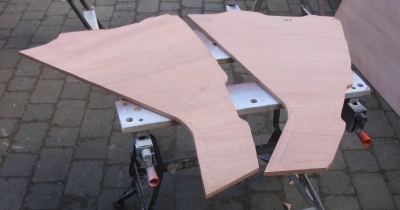 Here, the fibreboard templates are being laid out on the ply for tracing. Tools used to cut the plywood bulkheads. Jigsaw, steel straight edge and razor knife to scribe the straight lines for cutting, panel saw for the straight lines, drill with 8mm bit for tight curves where the jigsaw cant turn. 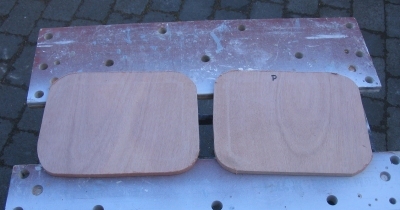 The two bulkheads, port and starboard, cut and ready for sanding on the surface and to round off the edges. These two inserts are needed to fill in the “rubbish bin” (clever builders those French) storage lockers on the after bulkhead. This entry was posted	on Wednesday, March 12th, 2008 at 6:13 pm	and is filed under Ballast Tanks.